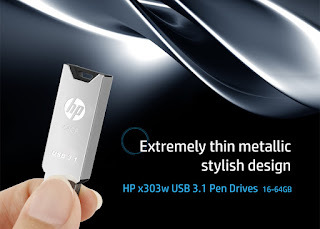 PNY Technologies® Inc. (PNY) is considered one of the worldwide leaders in consumer electronics market and flash memory products has released the HP x303w to store all your personal and digital files on the go in a stylish and functional storage device. 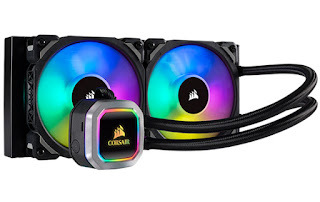 Get 10x lightning fast transfer speed rates of data with USB 3.1 specification that surpass the traditional USB 2.0 that other flash drives possess. Engraved with the trusted and reputed HP logo, the x303w is the ideal gadget to let you quickly access, store, transfer and procure files from the drive. The HP x303w features a robust and sturdy stainless steel housing and reflective metal designed in an extremely thin and lightweight structure. Despite its metal exterior, the drive weighs only 7.2 g and can easily be slipped inside your pocket or wallet. For hassle-free and convenient plug-and-pay functionality, the drive features a capless design and built-in keyhole that can be attached to key rings or bags for easy portability. Store large digital files, movies, hi-res images and folders with storage space from 16 GB and up to 64 GB. The highly efficient drive operates smoothly with Windows 7,8,10 and Mac OS: 10. X and later. The HP x303w is set to release in India in February, 2019 and will be available for sale at online sites and gadget stores nationwide. Please take note the HP USB Flash Drives models listed below went out of production in the India Market starting in 2018. Authentic HP products are available for sale from authorized re-sellers in India. A list of authorized resellers is available in the “Contact Us > Where to buy” section at www.pny.com.tw. Balaji Solutions Ltd and Fortune Marketing Pvt Ltd are the only two authorized importers and distributors of HP USB flash drives in India. PNY does NOT guarantee the quality of counterfeits or provide warranty service to counterfeit HP products. PNY Technologies® Inc. (PNY) is considered one of the worldwide leaders in consumer electronics market and flash memory products. 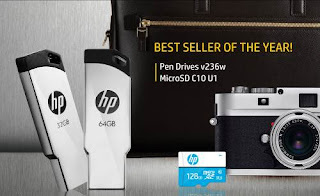 This Year PNY recommends these two HP products: v236w Pen Drive and U1 Micro SD card, for anyone that wishes to get a fresh start with Perfect for your day-to-day life, easy and convenient.